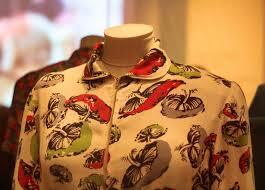 I’ve been very excited about Fashion on the Ration: 1940s Street Style at the Imperial War Museum. 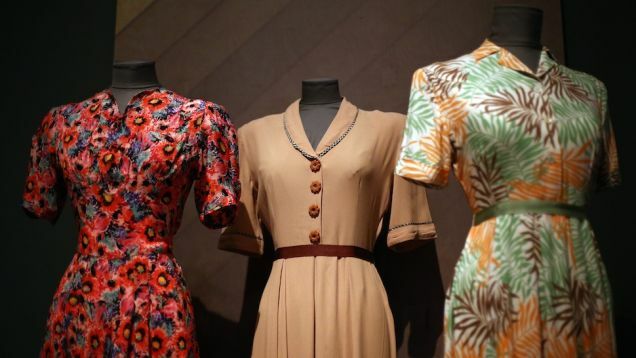 1940s fashion is one of my secret passions, and I have a little collection of dresses, shoes, hats etc; I’m not sure why it appeals to me so much, except that the clothes suit me and I find the period interesting. 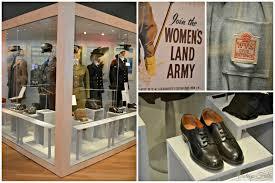 The IWM do a good job of explaining the way in which fashion changed in response to wartime; both rationing and changing cultures (women working in manual jobs, for example) affected clothes. Fabrics, embellishments and other materials such as metal and plastic used in clothes was restricted, so styles evolved which owed a lot to ‘make do and mend’ – altering clothes or completely making them over (such as cutting down a man’s suit to make a dress, or a wedding dress to make underwear). Fashion, and appearance generally, was considered very important despite the restrictions: looking good was seen as a way of keeping up morale and showing that the British weren’t being beaten; a Yardley advert of the time said: “To work for victory is not to say goodbye to charm. For good looks and good morale are the closest of allies.” And this isn’t about unaffordable, movie-star fashion: this is ‘street style’ – the focus is very much on ordinary women, their clothes, and their unpublicised heroism. From underwear made from parachute silk to wedding dresses worn by numerous brides, from siren suits (the original onesie) to Utility clothes (well-made but cut to minimise usage of difficult-to-obtain fabrics, and designed by top names), the exhibition explores how British fashion remade itself in the light of war. Many factories which once made luxury objects (lipsticks, buttons, suspender clasps etc) started making bullet cases or other essentials of war, so ingenuity was necessary to keep up appearances. 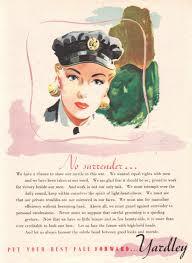 Beetroot juice might be used once all your pre-war lipsticks were exhausted, and stockings were replaced with graving browning and a line drawn with eyeliner (or charcoal, once that had run out). 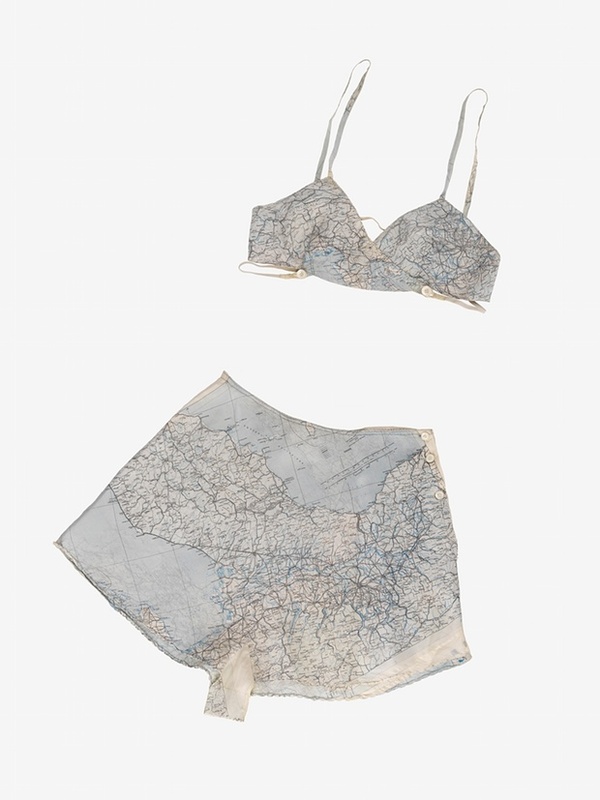 Old clothes were unpicked, unravelled, and carefully crafted into something new, while adornments might include jewellery made from aircraft parts (really! ), or crocheted from scraps of wool. The exhibition makes a good attempt to include men’s fashion, too, but it’s the dresses and accessories for women which steal the show. Personally I think I had rather hoped for more, somehow – I enjoyed it a great deal but it didn’t really tell me anything I didn’t know (though I was surprised/impressed by the psychedelic mushroom print on this housecoat, right), and many of the items on display were similar to ones I own; but that’s just me, and along with contemporary photographs, and accounts of women who lived through the war, it provides a great story about how fashion – and people – exceeded expectations in adapting to difficult circumstances.